green, productive open space tended by Asian people within a Sydney suburban landscape. Described as ‘an interesting and charming contrast to its surroundings’, the gardens bestow a rural ambience through the pleasing form and strong geometric patterns of their cultivated garden beds, the arrangement of their irrigation channels and creeks, their uncluttered views to adjacent open space and their remnant corrugated iron sheds scattered throughout the site. The proposed expansion of Botany Cemetery risks destroying the historical, state Heritage protected Botany Market Gardens. Graham Quint from the National Trust says such a move would be devastating to the heritage of the local area, as well as have a great impact on the social history of Chinese immigrants. 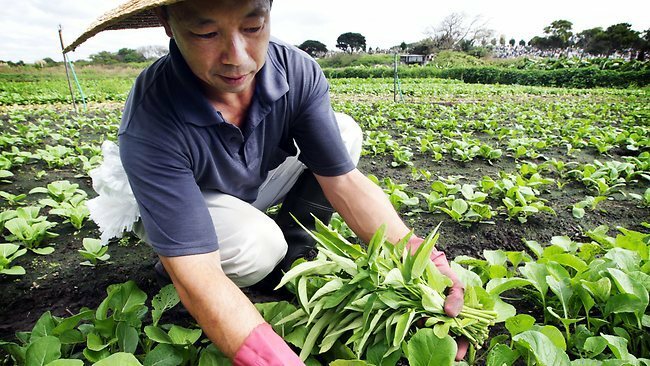 “The Botany Market Gardens have been occupied by the Chinese market gardeners since 1917, and it’s believed that gardens existed at the site right back to the nineteenth century,” Mr Quint said. “The gardens have helped feed the Sydney people for almost two centuries, and the gardens have great cultural significance for Sydney’s Chinese community. “The significance of the market gardens was formally recognized in 1999 when they were state heritage listed, and the Trust is considering listing the gardens on the Trust’s heritage register also. “The Trust strongly believes that heritage sites should be protected for the benefit of future generations, and the idea to destroy this important historical site to expand a cemetery is ludicrous. “These sorts of decisions should not be taken lightly. Once the area is destroyed, the decision cannot be reversed. We can never get back that piece of history once it is gone. In addition to the market gardens heritage importance, the area is a unique example of agricultural land use within the Sydney basin and the gardens help supply Sydney’s food needs. Growing food in the metropolitan area reduces energy and transport impacts, with state government documents acknowledging farms like this play a vital role in contributing to a sustainable future for Sydney. Powerhouse Museum Migration Heritage link. Three market gardens in La Perouse, among the oldest in the State, have been listed on the State Heritage Register for their significant heritage values, particularly to Sydney’s Chinese community. Working farms with links to the life of 19th century Sydney, they are the last surviving examples of the market gardens which were originally fairly widespread in the Randwick area. For over 150 years the land has been used for market gardens, firstly by European settlers and then by Chinese. The gardens were nominated as part of a Heritage Office program established in 1997 to encourage ethnic communities to nominate sites of heritage value in NSW. This will mean that the State Heritage Register can provide a more accurate picture of Australia’s culturally diverse heritage. Market gardens played an important role in supplying the food needs of the growing settlements of NSW. By the end of the 19th century, these labour intensive farms had become almost synonymous with the Chinese and were part of the everyday life of many towns and cities. The earliest farms in the La Perouse area were recorded in 1830. At first the gardens were tended by Europeans and supplied vegetables to some of the wealthiest homes in Randwick. But this changed after the gold rushes. Many of the gardens in the La Perouse area survived well into the 20th century. Older residents still recall the market gardeners who worked on the farms and lived in corrugated iron huts. The La Perouse gardens have special significance for the Chinese community. “For many people, especially those from the Yiu Ming district of Guangdong, market gardens were their starting point in Australia. They worked hard and saved and then opened restaurants, grocery shops, their own businesses” says Karl Zhao. The gardens have been managed by members of the Chinese community for over 90 years, passing from one generation to another without a break. The still working gardens have maintained features of a traditional market garden and even today, most of the work is done by manual labour with simple tools. Nowhere else so close to the modern, busy centre of Sydney is land still worked in this way. Gordan Ha’s family have been involved with the La Perouse market gardens for over 40 years. “My father came from overseas and worked on this farm with his cousin. He worked and studied English at the same time” said Mr Ha.